July 17, 2018, Huntingdon Valley, PA – The Fredericks Company, an industry-leading innovator and manufacturer of vacuum measurement and tilt measurement products, today announced the launch of the Televac® MX Active Gauge EthernetIP Gateway, the first and only network communication solution designed to provide EthernetIP communication between any Televac MX active vacuum gauge and Rockwell Automation® Allen-Bradley® PLCs. An increasingly popular industrial network communication standard, EthernetIP offers faster and more reliable vacuum measurements and eliminates the need for expensive analog-to-digital converters for vacuum gauges. The MX Active Gauge EthernetIP Gateway, designed primarily for the vacuum furnace and heat treat industries, supports an easily configurable network of Televac active vacuum gauges through EthernetIP communication, including networks of cold cathode gauges, convection gauges, and capacitance diaphragm vacuum gauges (CDGs). The EIP Gateway supports CDGs from MKS, Inficon, Leybold, Brooks, and Setra, making it simple to integrate with existing vacuum gauges on a system. Users can interface directly with supported PLCs and PCs, giving them the ability to acquire vacuum measurements and adjust settings from a convenient, remote location without expensive conversion equipment. 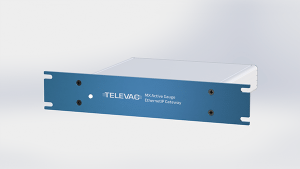 The EIP Gateway provides access to all features of Televac MX vacuum gauges over EIP and allows for easier digital calibration through a PLC and HMI. With a built-in web server, field upgradable firmware, and a rack mountable design, this network solution is the first of its kind on the market for vacuum measurement. For more information or to request a quote, visit www.frederickscompany.com or call us at +1 215-947-2500. For more than 80 years, The Fredericks Company has partnered with OEMs and customers worldwide to design and develop tilt sensors, vacuum measurement devices, and precision custom glass components for their finished products or processes. Fredericks’ team of engineers and application specialists deliver broad practical knowledge and experience across a wide range of markets and applications. In keeping with the company’s history of outstanding customer support, Fredericks provides the insight and guidance needed to take design concepts to reality in a cost-effective manner. For more information visit www.frederickscompany.com.